"For decades," said Mr. Wei, "we've been trying to encourage giant pandas to mate in captivity, partly because they are so cute and adorable and partly because we needed an efficient means by which to dispose of an enormous bamboo glut that was pushing our economy to the brink of disaster. The failure to make woo of the last panda couple we tried to force to make woo, Hu and Krai, led to the immaculate conception, if you will, of the Extraordinary Panda Cloning Project." "If they had succeeded," Mr. Wei added, "we were planning to name the panda cub Wu." Chinese scientists, under the direction of then-president Qinghong Zeng, embarked on an ambitious program to rebuild the giant panda population, a national treasure, through experimental cloning and genetic engineering. "The goal," said Dr. Yao Ming, director of the Glorious Revolutionary Gene-Tweaking Laboratory in Heilongjiang province, "was to create an initial 'start-up population' of hyperintelligent giant pandas that would like nothing better than to reproduce in captivity day in, day out, for the benefit of an appreciative audience, and that would also be rapacious consumers of bamboo. I think it's fair to say we've achieved both of those goals, but, in hindsight, perhaps a bit too well." According to Dr. Ming, the cloned giant pandas do indeed possess impressive appetites for both bamboo and the practice of public mating in confined spaces. 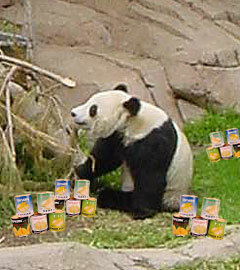 "The problem," Dr. Ming said, "which we discovered almost immediately after transferring the cloned pandas from their giant petri dishes into simulated living environments, was that they would only eat bamboo if it had been peeled, cooked, sliced, and put into little metal cans. If they didn't get it, they would become extremely irritable and even aggressive." This discovery caused Dr. Ming and the rest of the Glorious Revolutionary Gene-Tweaking Laboratory team to almost immediately question the wisdom of having launched the panda program with an initial batch of over 925,000 cloned giant pandas. "That's a lot of little cans of bamboo, even for a country the size of China, particularly when one considers that a typical giant panda will eat over 2,000 cans per day," said Dr. Ming. Despite the best efforts of the panda team, the country's supply of little cans of bamboo was effectively exhausted after only three days. "By the fourth day, which was two days ago, they snapped," said Dr. Ming. "The result is what I would term a 'catastrophic success'. We had tweaked their DNA so well that the pandas were both remarkably intelligent and capable of swift and decisive action. They had also apparently developed a highly focused ability to channel their aggression." The 925,000 giant pandas very swiftly organized themselves into revolutionary battalions and took over the Chinese army, navy, air force, and media outlets using their world-renowned cuddliness as a guise by which to take the entire military by surprise. A few hours later, the government was in their paws. "Now, I'm afraid, this has grown into a bit of an international problem," said spokesman Wei. "The hyperintelligent giant pandas have taken control of our arsenal of nuclear weapons and apparently figured out how to use them. According to the official statement they issued this morning, they want the entire world to start harvesting, preparing, canning and shipping bamboo to the capital immediately, or they'll start detonating random cities. They've given us 24 hours to put together the first daily shipment of two billion cans. Oh, yes, and I'd like to add that President Yo sincerely regrets any inconvenience this may cause."